Central Asia has restructured its economic links over the past decade, as China has outpaced Russia in the region on trade, investment and infrastructure development. 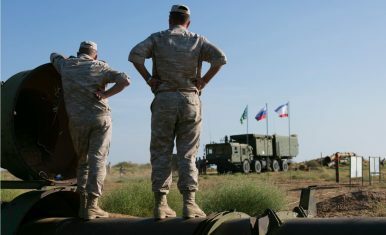 The year 2017 marked several important milestones for Russian-led “not-so-allied” alliances: the Collective Security Treaty (on the basis of which an organization of the same name, the CSTO, was created) turned 25, while the Commonwealth of Independent States Joint Air Defense System (CIS JADS) received an “adaptation roadmap” to tackle Air-Space Defense tasks. Several high-profile multilateral military exercises took place, and their analysis may help understand the grand strategy of Russia and other participants in these groupings. Basic Guidelines for the CIS Joint Air Defense System (JADS) Adaptation to the Air-Space Defense (ASD) tasks were signed at the meeting of the CIS Heads of State Council in Sochi in October 2017. The process is due to be completed by 2025.Enjoying this article? Click here to subscribe for full access. Just $5 a month. Currently, Armenia, Belarus, Kazakhstan, Kyrgyzstan, Russia, Tajikistan, and Uzbekistan (as well as Turkmenistan as an observer) provide the Air Defense System of the CIS Member States (CIS Air Defense Forces) with 19 aviation units, 38 anti-aircraft missile units, 16 signals units, nine air defense brigades, and three electronic warfare (EW) units. The main directions of JADS adaptation presumably include developing the regulatory framework, improving the organizational structure and management system, further integrating the forces and assets, and creating several subsystems, i.e. reconnaissance and early warning, countering aerospace attacks, command and control, and maintenance. Neither the five formerly Soviet states of Central Asia nor Afghanistan is happy with the current setup, and with good reason. The “Greater Heartland” acquires its premier strategic and economic importance due to being the supercontinental fulcrum of multipolar integration. As was mentioned at the end of Part III, there’s a direct overlap between Russia’s Eurasian Union and China’s New Silk Road, and the countries of Kazakhstan, Kyrgyzstan, and Tajikistan presently fall under both connective umbrellas. To those attuned with geopolitical theory, these three states noticeably correlate with the broad territory that early 20th-century British strategist Halford Mackinder termed the “Heartland”, which he defined as the geopolitical pivot of Eurasia. More contemporary strategists narrowed the region down to the former Soviet Republics of Central Asia, but the author feels that this is presently insufficient to accommodate for the changing dynamics of the evolving world order, and thus proposes a modification of the concept to include Iran, Afghanistan, and Pakistan as well. This redefined version of Mackinder’s original thesis moves the center of geopolitical gravity in a more southwards direction (by contrast, Mackinder’s broad contours included all of Siberia and most of the Russian Far East) in order to reflect more relevant areas of geopolitical competition between the unipolar and multipolar worlds in the context of the New Cold War. Aug. 29, 2016 The authoritarian Uzbek leader’s hospitalization could mean chaos in the region. While the world continues to be captivated by ever-growing crises in the Middle East, the nearby region of Central Asia is headed toward destabilization, as our 2016 forecast suggests. Kazakhstan and Uzbekistan have been ruled by geriatric strongmen for over a quarter of a century, going back to the days of the Soviet Union. Uzbekistan is at great risk for instability, given that its president has been hospitalized after a reported stroke with no clear succession plan among regional clan rivalries. Since Uzbekistan borders each of the countries in the region, instability there could destabilize in the rest of Central Asia as well. Islam Karimov, Uzbekistan’s 78-year-old ruler and the only president the country has had since the collapse of the Soviet Union, has been hospitalized, according to reports on Aug. 28. According to official state media outlet UzA, Karimov is receiving in-patient treatment and unnamed medical specialists said that “a full medical examination and subsequent treatment will require a certain period of time.” Uzbekistan is an extremely opaque nation, and thus it is difficult to ascertain the precise status of Karimov’s health. That said, Tashkent has never before released information on the health of the ailing president, which is why it is reasonable to assume that a leadership transition is finally at hand. Uzbekistan is not your average authoritarian state. Many autocratic regimes, despite the overwhelming influence of the ruling family and friends, develop institutions. In sharp contrast, multiple clans from Uzbekistan’s various regions have long been struggling for power. Karimov was able to rule because he could balance the clans from the country’s three principal regions (Samarkand, Tashkent and Fergana) and four lesser ones (Jizzakh, Kashkadarya, Khorezm and Karakalpak). In addition, Karimov’s family has been at war with itself – as is evident from the publicly acrimonious relationship between his daughters, Gulnara Karimova and Lola Karimova-Tillyaeva. This combination of two pictures shows the elder daughter of Uzbekistan’s president, Gulnara Karimova (L) and her sister and Uzbekistan’s representative to UNESCO, Lola Karimova-Tillyaeva. Gulnara has accused her sister of destructive behavior and ties to sorcerers, in a public row that has exposed rifts in the Central Asian ruling family. This means there is no clear line of succession and great risk of a power struggle. The regional bases of the various top clans in the country increases the risk of civil war, though it is possible that the massive costs of infighting could push the elites to negotiate a power-sharing settlement. Moscow should stop thinking of the other members of the Eurasian Economic Union as junior partners. Russian and Central Asian weakness vis-à-vis China should inspire consolidation and cooperation rather than competition. In the two years since Russia began its “pivot to Asia,” Moscow has touted its involvement in two major regional initiatives: the Eurasian Economic Union (EEU) and the Silk Road Economic Belt (SREB). When presidents Vladimir Putin and Xi Jinping signed a declaration on cooperation between the EEU and the SREB in May 2015, Moscow and Beijing agreed to coordinate their economic initiatives on the continent for the first time, potentially ushering in a new era of Eurasian cooperation. Both projects looked promising initially. Moscow’s involvement added global prestige to Xi Jinping’s SREB initiative, allowing above-ground transportation routes to run from China to Europe, and providing new markets for Chinese manufacturers and infrastructure companies. The SREB seemed to have the potential to bring China and Central Asia closer together and to strengthen the position of the yuan as the regional currency. Chinese recognition of the EEU seemed to fulfill Moscow’s desire to be respected as a global economic and political force, and set the stage for Russia to receive Chinese credit on favorable terms, as well as investment in infrastructure projects connecting the members of the EEU. For their part, the Central Asian nations expected engagement with China through the EEU to give them access to cheap Chinese money, as well as investment and employment opportunities.